Here at ribot we spend most of our time finding solutions to the challenges our clients face. We’re asked to innovate and build completely new digital products, but we are often approached by clients who simply want to improve what they’ve already got. This seems complex, but it’s actually quite simple for us to provide some instant UX and UI recommendations based on our experience, design expertise and heuristic evaluation alone. Design and psychology are tightly linked so, to create the best products, we really need to understand how people function. There are so many biases, nuances and quirks that designers need to consider in order to create the most effective experience. The ribot design assessment includes a heuristic evaluation and application of behavioural psychology principles, which can help you to adapt your products to meet your user’s needs and expectations. Whether that’s to buy more, reinforce positive habits or to create more powerful bonds to a product or service. We back up our design assessment with our Cognitive Lode brain gems. Cognitive Lode, created by ribot, is a resource that collates the latest research in behavioural economics, cognition and consumer psychology and packages it up into digestible, easy to understand articles, or brain gems. For an example of a typical Cognitive Lode brain gem, take a look at the trivialization effect. A ribot design assessment includes a heuristic evaluation, which involves having a small team of ribot UX evaluators examine the journey your users take when using your product. They then judge the compliance of that journey with recognised and proven usability principles or ‘heuristics’. The study helps to quickly uncover usability problems in the user interface design. Heuristic evaluations are quicker and cheaper to perform than full usability testing. This works if you are looking to make some immediate small changes to your platform or interface and test them. We then recommend improvements, along with sketches, to improve the user’s journey and/or user interfaces, screen by screen. We start by asking “What do we want the user to be able to do?” The answer is often based on feedback and data given by the user. We review a pathway through the flow of the app or website or for a specific task, like the process of booking a place to stay, for example. We look at potential areas that might be causing users to get frustrated and lose interest, or “drop-off”. We ask that you supply analytics data to assist in this process. Throughout the process we highlight a list of problems. We seek to understand the problem and distill it in a way that reduces cognitive load. This provides a methodology for arriving at a solution. Cognitive load reduction – bringing together lower level data into a higher-level summation. Why do a design assessment and heuristic evaluation at all when you can do a usability study? Heuristic evaluations are intended to complement usability studies, not replace them. A heuristic evaluation quickly and efficiently highlights potential issues against known rules of thumb. The ribot design assessment includes sketches of proposed solutions so you can quickly start testing with users - either immediately or as part of a larger usability study. There is often a steep drop off during online purchase at the checkout stage, especially on mobile. The psychological principle behind this translates into human behaviour - if a user feels uncertain, they are unlikely to take action. During checkout users feel uncertain about how long the process will take them to complete. One way to increase certainty for users is to break the checkout experience down into clear, visible steps. As soon as the user enters checkout, the steps should be clearly laid out. There should be a clear beginning and end. The users should know how many steps they need to take to complete checkout. This creates more certainty for a user and makes them less likely to abandon the process. Another way to increase certainty is to add easy ways to pay like Apple Pay and PayPal. 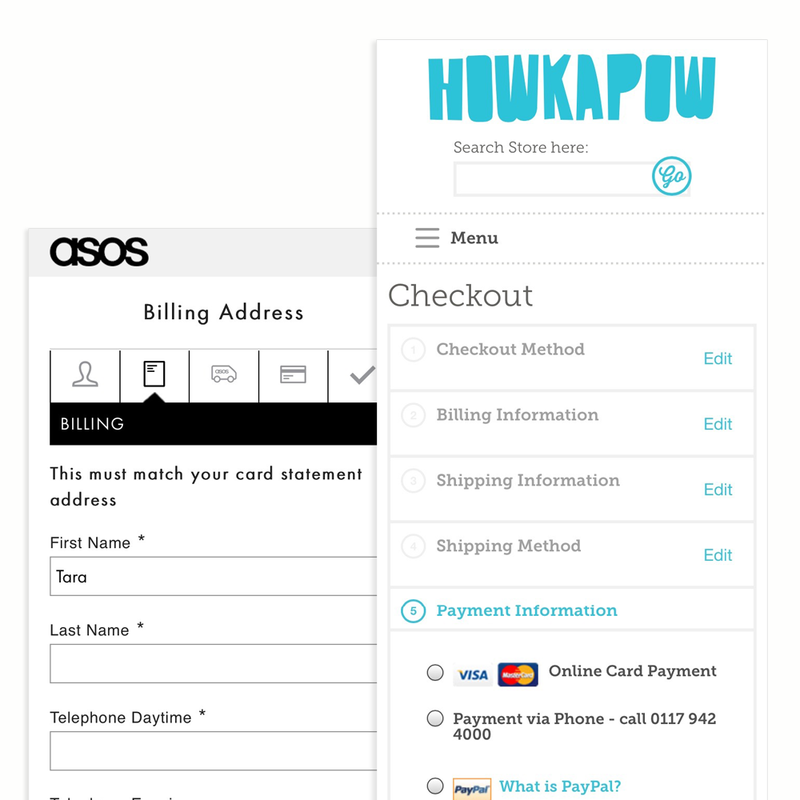 Below are examples from asos and howkapow.com. These are good examples which clearly show a high-level view of where the customer is in the process. Not showing this information creates uncertainty and the user is less likely to act. Sometimes a business or designer will want to create a digital experience that is very different from their competitors and industry leaders. It’s important to remember though, that your users are likely to already have an existing mental model of what your service should do. If you steer too far away from that known model, the experience will seem more complex. It is beneficial to research common UI elements, wording and navigation from competitors in your industry. It will help your product feel more familiar to the user and it will be easier for them to navigate, which in turn should aid conversion. Here you can see some good examples. You can see that there are similarities between airbnb, booking.com and laterooms.com. Even though airbnb disrupted the market, there is still consistency. Often you will find users spending a long time in a particular area of your product before dropping out. Is this an area of your experience where the user needs to recall rather than recognise? 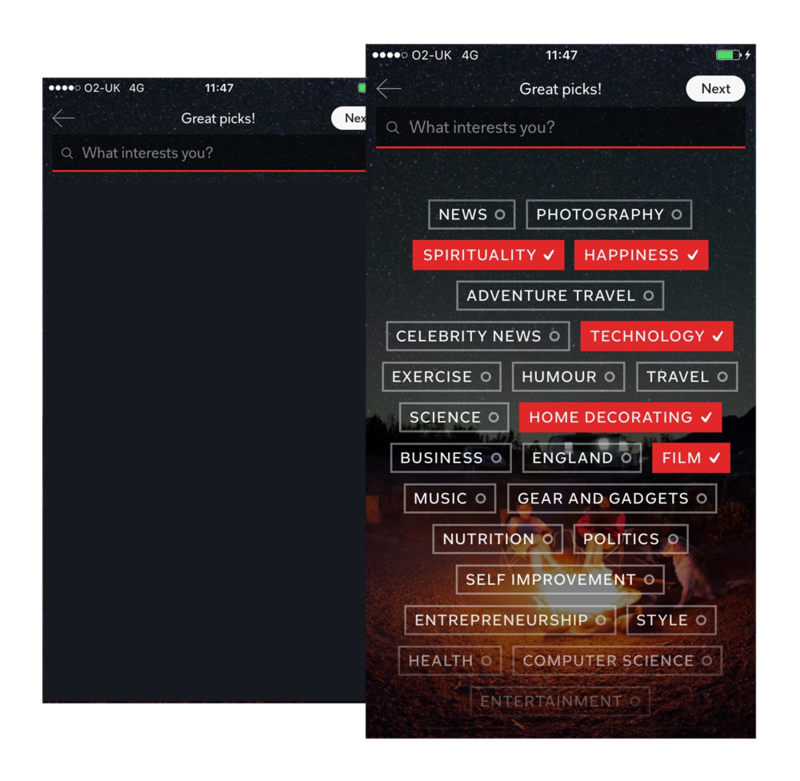 The Flipboard app asks ‘What interests you?’ Recalling interests from scratch takes a lot longer than recognising them so the app provides a list of selectable options to get the user started quickly. This reduces cognitive load. We’ve manipulated the first image below to show what it would look like if Flipboard didn’t provide a selectable list of options. 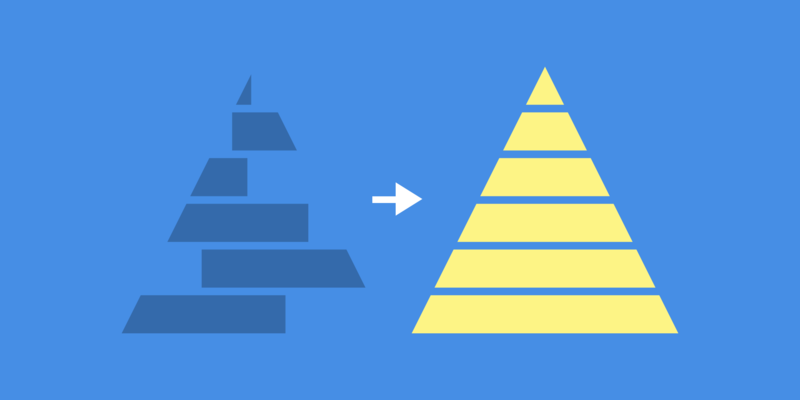 The easier you can make an experience for a user, the higher your conversion is likely to be. After completing a ribot design assessment, we hold a debriefing session and provide you with a document of our findings. We will highlight conversion blockers and make suggestions on how to remove them. In the session we can suggest possible redesigns to address the major usability problems, focusing in on areas that will make the biggest difference. We can provide an initial assessment in under one week. This helps you with some good new possible solutions that can be moved forward into testing. If you want to talk to us about a ribot design assessment to help you increase conversion, simply contact jo@ribot.co.uk, call 01273 737 269 or complete our contact form. The price for this service starts from £4,500 for an initial assessment and we can work on a retainer basis for ongoing activity. Mental Notes brings together insights from psychology. Each card describes one insight into human behavior and suggests ways to apply this to design. In our examples in this blog we have referred to the Mental Notes: Need for Certainty, Sequencing and the Familiarity bias.